Among the many risotto variations, asparagus risotto (‘risotto agli asparagi’) is one of the most successful, and one of my favorites. 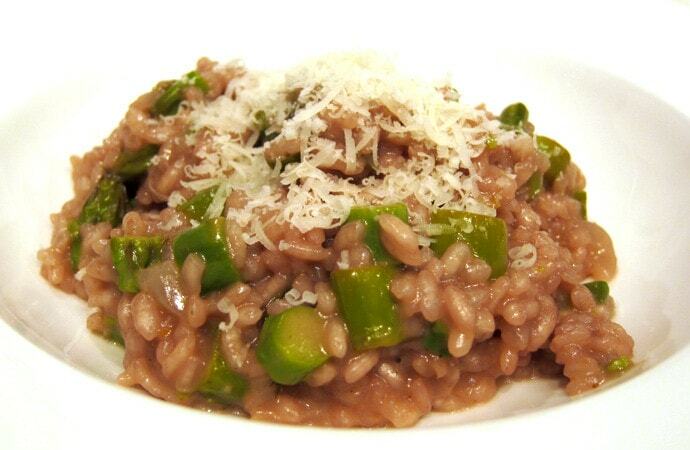 There are a few different ways to incorporate asparagus in a risotto. In my recipe, diced asparagus are added in stages, from the bottom of the stalks to their tops, to ensure uniform cooking and to get the most in terms of flavor. For best results, however, it’s recommended to use the freshest possible asparagus. Since the shoots are still actively growing, even if kept in the fridge and in the dark over time they tend to consume their own sugars and to dry out(1). 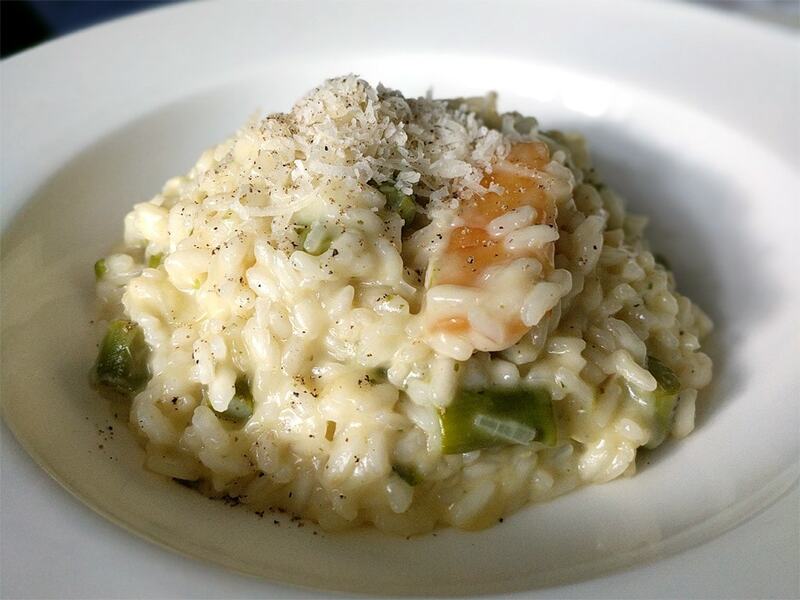 For this risotto variation, I made use of the Parmesan rind as a way to add more flavor, and because I love eating it in small bites together with the risotto. As I mentioned in a previous risotto recipe, the rind is added at the beginning of the preparation so that it cooks and rehydrates along with the rice. If you haven’t had Parmesan rind, however, you may find it chewy and too strong. In that case, you may want to use it just as a flavoring aid during the cooking and then discard it. Wash and trim the asparagus. Thinly slice the shallot. Cut the asparagus in three sections: lower stalks, middle stalks, upper stalks. Cut the lower stalks lengthwise and add them to the vegetable stock (which you'll have boiling in a second pot). Slice the middle stalks in ½ inch cylinders. Slice the upper stalks thinly, but leaving the buds whole. Sauté the shallot in the butter for a couple of minutes at medium heat, then add the middle stalks. Add the rice and "toast it" for a couple of minutes, stirring occasionally. Add the wine and set a 18-minute timer (15 if you're using Arborio rice). Stir until the wine evaporates. Then add the Parmesan rind. Add the asparagus-flavored vegetable stock, on ladle at a time, stirring constantly until absorbed. When there are 10 minutes of cooking remaining, add the upper stalks and buds. When there are 5 minutes of cooking remaining, add 2/3 of the grated Parmigiano. Continue adding the vegetable stock, one ladle at a time, stirring constantly until absorbed. Add the last of the stock when the rice is a couple of minutes from being ready: at the end, the risotto will need to be slightly runny. When the time is up, take the pot off the heat. Add "a nut" of butter and stir gently for one extra minute. Serve sprinkled with the rest of the Parmigiano and a hint of black pepper. I know I should have been saving my rinds all this time for soups and risotti, but I have not. I promise I will save the next rinds and. by the time I have enough, it will be asparagus season here and I will make this. Thank you, Paolo, for this wonderful recipe!